The Dashboard contains mini boards or widgets which contains different information, links or activities to help you get the most of out Tanda. One of those widgets is the Weekly Planner. 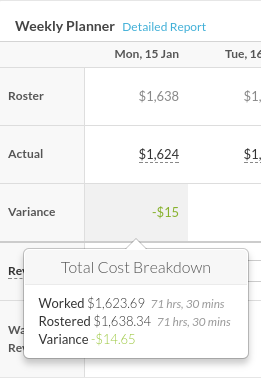 The Weekly Planner helps you manage Wage Costs by giving a quick snapshot of the Total Cost of the daily Roster, Timesheets and the Variance. You can also link your Revenue data to develop Wage % of Revenue. View the Roster, Actual and Variance total for each day. The roster shows as greyed out as it shouldn't be edited at this point to show accurate reporting. . The Actual is based on approved Timesheets and you can click on the figure to go to Daily Timesheets. Just a quick note on Team Managers who don't have access to view Staff Costs, they won't see any dollar values in the Weekly Planner. They would only see data in Hours format. If you want to move where this widget sits on your Dashboard, hover over the heading until you see the 4-arrows and then click and drag to the new location. Widgets can't be minimised or deleted.